Google is your helpful friend. It helps you remember the name of what’s-his-name, the actor. It keeps track of your calendar. It tells you if there’s traffic on the way to work. It helps bring affordable smartphones to developing nations, provides an open source version of Android for anyone to use, and generally tries not to be evil. Your old pal Google. Not anymore. Google’s learned nice guys finish last, so it’s done playing nice. Control is the new name of the game. Arguably, Google has always wanted some control, it just never seemed all that bothered about getting it, and adding it to the day’s to-do list never really happened. Google has had enough of that. No more brushing it off, no more hiding the pang of jealously it gets looking at the control freaks at Apple, Facebook, and Amazon. No more Mr. Nice Android. This means if you want to continue as an Android fanatic and Google fan, you’re going to have to bow down and do what it says. Google’s new Pixel phones, and the Google Assistant built into them, give us the proof. There’s plenty of gushing talk about how they signify a revamp of Google’s mobile strategy, and how the Pixel phones were needed to take on Apple, but much less about the 180-degree turn they represent for Google’s way of thinking about hardware and its customers. Google is tempting you to buy these devices, so it can pull you deeper into its growing ecosystem. Google is the “seller of record” for the Pixel phones. That’s a nonsense business phrase that means “these are ours, OK? !” before anyone says they also belong to HTC, the company that built them. Google’s Rick Osterloh, the new man in charge of Google’s hardware strategy, likened working with HTC to Apple working with Foxconn. In other words, do what we tell you, HTC, and don’t answer back. You’re just a factory. In the past, Google has worked with manufacturers to co-produce smartphones under the Nexus name. Sure, the resulting devices were a mixed bag. Some good — the Nexus 5 and Nexus 6P — and some less good, like the Nexus 5X. But they were very Google: non-threatening, usually affordable, and rarely backed by an in-your-face sales campaign. They’re now a thing of the past; Google told us that no new Nexus phones are planned. A tweet from the Nexus account also said goodbye in a roundabout way, placating fans with promises of software updates and conversation about the good old days. The old Google was happy with partners. The new Google wants to give the orders and be obeyed. Android phone owners usually welcome every new OS update due to an influx of new features. Google Assistant is the big new feature in Android 7.1 that comes installed on the new Pixel and Pixel XL phones. We bet you’re looking forward to it on your Samsung, LG, HTC, Sony, or even Huawei phone, right? Keep hoping, because for the moment, it’s not coming. Even when you eventually get version 7.1, Assistant won’t be there. A Google spokesperson told Digital Trends that Assistant is locked to Pixel phones and Google Home. It’s not even certain Assistant will reach Nexus phones with Android 7.1. How’s that for some control? CEO Sundar Pichai said, “We’re evolving from a mobile-first to an AI-first world,” and its new hardware range based around the Assistant reflects this statement. However, Google’s not silly. It knows for its AI products to succeed, others will have to link into it, so it’s giving up a little bit of control with the Assistant SDK, where third-party developers and companies can make their own Assistant compatible devices, or add support to existing ones. Because Assistant only works with a Pixel phone and Google Home for now, Google is tempting you to buy these devices, so it can pull you deeper into its growing ecosystem. 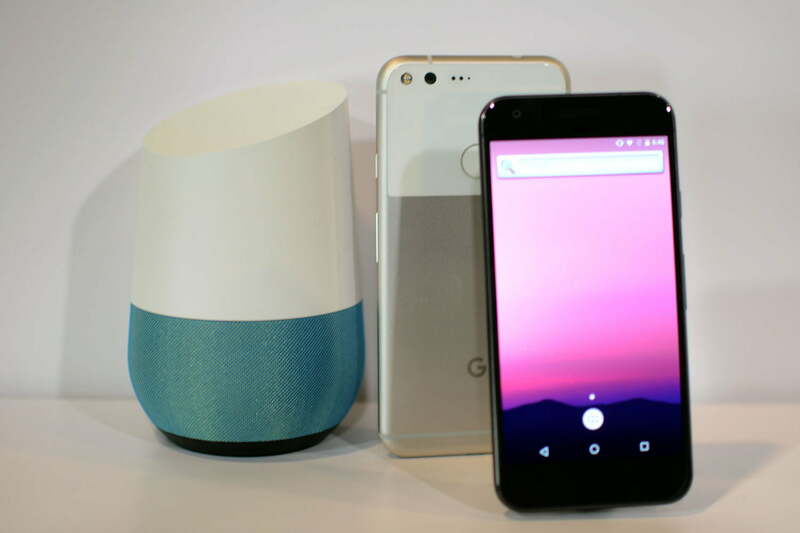 The Pixel phones are expensive, but Home and Chromecast are considerably cheaper. They’re lovely little add-on products thrown into your basket as you reach the checkout. Google’s Allo messaging app, which also features Assistant, is even better because it’s free. Next year when Android Wear 2.0 is finally released, Assistant will be present in the form of Smart Reply. To get the most from Assistant — and it’s the real heart of Google’s ecosystem — you’ll need to buy the hardware, use the apps, and relinquish control of your music, movies, apps, calendar, email, and just about everything else to Google. Hold on. We’re pretty used to these tactics. Apple, Amazon, and Facebook work tirelessly to keep you in the family, and most of us are happy to accept it. Many people feel safe. Protected. But you knew what it meant when you signed the deal with these companies. There was never any pretense. If you didn’t like it, you went somewhere else. Like Google. Not anymore, and that’s what makes this rather distasteful. Google was always a bit different, never truly committed to keeping you held hostage. It held an open-door policy, if you like. Now, if you want the latest and greatest features in Android 7.1 and want to enjoy the amazing features that Assistant offers, you’re going to have to do what Google says, just like HTC. Not only that, Google’s taking all the best bits and not sharing them, so at least for the foreseeable future, buying any other Android phone means being on the outside looking in. Who knows what you’ll miss out on next. It’s almost like the problems with not getting updates applied to other Android phones on a timely basis, the substandard user interfaces placed over the top of Android, and the inconsistent quality of Nexus releases got to be a little too much. Enough, said Google. Let’s just do it ourselves. It’s understandable, and now the company has grabbed back the reins. We get it. It doesn’t mean we have to like it. The technology world didn’t need another full-blown ecosystem vying for our paychecks and attention, and certainly not from the company that was once something of a safe haven from such a thing. Buy a Pixel if you want. Use Assistant. Just be aware of what you’re getting into, because it’s not the same Google we once knew. The views expressed here are solely those of the author and do not reflect the beliefs of Digital Trends.